Google mail has set up its own version of the 'Out of Office' reply that many office workers will be familiar with. The service is called Canned Responses. Essentially just a way of sending a stock response to a common email, the feature lets you choose a number of replies from a list, thus saving you valuable typing time that could be better dedicated to that NES version of Teenage Mutant Hero Turtles you found on a website. But apparently this feature isn't enough for some people. SOME of you want to eradicate all the pointless clicking too, which is why Google has unveiled a service that automatically answers for you too. 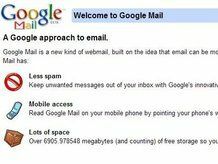 Using the filters already developed for Google Mail, which are based on a combination of keywords, sender, recipients and more, the server automatically decides which emails are worthy of a canned response and which it thinks you should read. You can set up different responses depending on the keyword, but you'd better make sure the messages go to the right people, else some might consider you rude. "Dear Qwame, we were terribly troubled to hear that your father, the Nigerian King, is in trouble again (he does get around, doesn't he?). While it is true we are old acquaintances, and dare we be so bold, friends, we find it hard to believe he would entrust us with his money, given that we still owe him a fiver from that night when we were lost in Brixton and needed to get a taxi home. We understand he is in dire political trouble, but if you could ask him when we can have our PSP back next time you see him, that would be great.